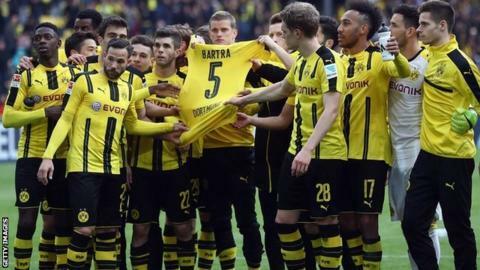 Borussia Dortmund defender Marc Bartra has been released from hospital, four days after he was injured in an attack on the team's bus. The Spaniard, 26, was injured when the coach was damaged by explosions as it travelled to Dortmund's stadium for the team's Champions League quarter-final first leg against Monaco on Tuesday. Bartra had an operation after fracturing his wrist in the incident. He is expected to return to training with his team-mates in a month. In a post on Instagram on Friday, he described the incident as "the longest and hardest 15 minutes of my life". Tuesday's match was postponed and played a day later, with Monaco winning 3-2. Dortmund beat Eintracht Frankfurt 3-1 in the Bundesliga on Saturday. Three explosive devices containing metal pieces went off soon after Dortmund left their hotel to travel to Tuesday's game. German police detained a suspect with "Islamist links". But, on Friday, investigators said there was "significant doubt" the attack was the work of radical Islamists. They said letters found at the scene may be an attempt to trick people into thinking there was an Islamist motive, and it may have been the work of political extremists or violent football fans.